Dental Crowns (caps) protect and keep badly decayed or fractured teeth from further decay. First, decay is removed and cleaned from the tooth. Then a filling called a buildup is bonded in to replace a specific amount of tooth that was missing due to the decay. Dr.Patel is one of the very few dentists that use a CEREC machine to fabricate a porcelain crown immediately, following the preparation of the tooth. This means no terrible gagging impression, flimsy uncomfortable temporary, or return visit. 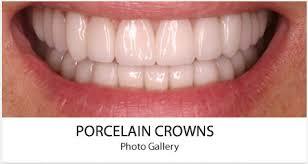 You receive your permanent porcelain crown bonded and sealed in place in one visit. Crowns are incredibly strong beacuse they are a single unit. This protects and strengthens the remaining tooth structure. In the hands of a skilled dentist, a crown will fit almost perfectly onto the prepared surface of the tooth, reducing the size of the seam between the crown and the tooth. This helps keep decay from eventually occurring under the crown. Crowns should be placed before the tooth fractures due to decay or large fillings. This can often help prevent the future expense of root canal therapy. It can also prevent the possibility that a fractured tooth may need to be removed, requiring the expense of a bridge or implant to replace the missing tooth.